Do you have jewelry sitting neglected in your jewelry box because the prongs are worn, or diamonds are missing? Are you looking for a jewelry repair craftsperson you can trust? No matter how skillfully crafted a piece of jewelry is, over time it will naturally experience wear and tear. The metal will tarnish, dings and scrapes may happen. And you may even lose a stone because the prongs may have become broken or bent. Clasps are delicate and can break. It is a fact that your favorite and most beloved pieces of jewelry will at some point require some refurbishment and/or repairing. And Jack Miller Jewelry Designers can make your valuable jewelry new again with expert jewelry repair and refurbishing. Decades of experience and the best of both the old-world craftsmanship and contemporary technology are employed to make your prized pieces whole again. Ring resizing is one of the best investments you can make when it comes to your jewelry and rings. When you wear a ring that is too large, you run the risk of that ring slipping off your finger and getting lost. While if your ring is too small you will tend to not wear it due to discomfort. 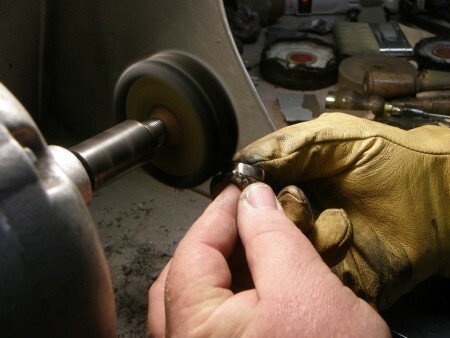 Let our team take away the thought of your ring not fitting perfectly, we specialize in resizing rings of all designs. When it comes to jewelry repair on necklaces and bracelets, normally the first component to give way is the clasp. This is because the clasp, which is the piece that joins one end to the other, has mobile parts and is therefore prone to wear. This is also the component that has to endure most of the burden and weight of being pulled and tugged. There are a variety of types and at times fixing it may simply require severing the old one off and replacing it with a new clasp. Although many times this could possibly be done at home, it can be a bit complicated and you will have better results if it is handled by a jewelry repair expert. If a clasp fails or breaks on more than one occasion it is an indicator of a deeper issue with the structure. To fix the issue, other parts may have to be replaced or a different kind of clasp may have to be soldered on. If this is the case, it is definitely important to allow a professional to handle the issue. The normal force that chains and bracelets are prone to could weaken the links causing them to eventually break. Although it is easy and simple to fix or replace the links, it remains a hob that is best performed by a professional. This is something that is typically seen with rings, particularly engagement rings and wedding bands. The reason is due to the fact that for years, they are always worn. The friction between the skin and the metal is what causes it to wear down and weaken; the spot that becomes weakened can break. By adding metal to them, spots that are worn can be fixed, this can prevent further damage from occurring. When it comes to this type of repairs of jewelry, an expert goldsmith is who will perform the job the best. Normally gemstones are held in place by “prongs” or “claws,” eventually with use, the prongs will wear down and could even break off. If this were to occur, the stone is susceptible to breaking out of its setting, this is especially true if more than one prong is affected. Much as with ring bands that are worn down, in order to build back up the prongs, brand new metal should be added. Taking on this kind of repair job is something that an expert should handle. At times a prong could easily slip out of place; this will happen if a piece has received a physical blow of some kind. In order to bend the prong back into place, the services of a professional are required; a professional will also be able to advise you if any other damage has occurred to your piece. Jewelry Repair for Lost Stones? Normally losing a stone off of one of your favorite pieces of jewelry can be very disheartening. Lucky for you, this is a problem that a professional can fix. It can be quite expensive to replace the stone, however, most jewelry owners want to preserve a treasured piece and are happy to have the gem replaced. We also have a specialist for watch repairs. Jack Miller Jewelry Designers has been working with insurance companies for over 20 years. Their job is to replace, or give a fair and honest replacement value of lost or stolen jewelry. Assessing the value of your jewelry and writing an appraisal so you can insure it is a very important facet of Jack’s business. Just call and set up an appointment.